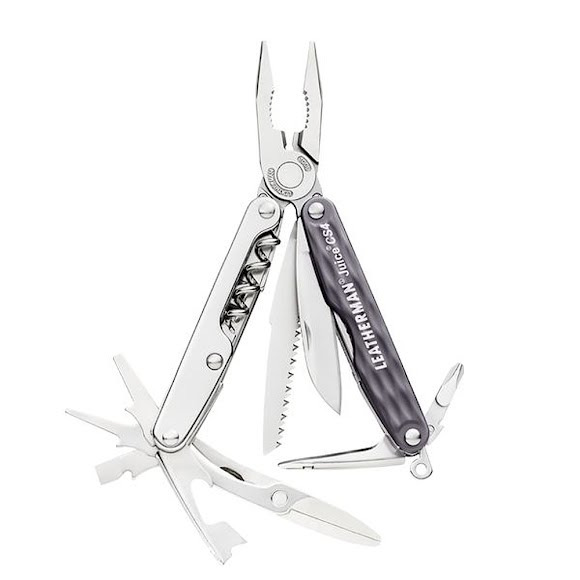 The Leatherman Juice CS4 is their second largest Juice model, and just like its bigger brother, it's the perfect size for a purse, pocket, glove- or tackle-box. Smaller hands will appreciate all the same power and features as other full-size multi-tools, with handles sculpted just for them. The Leatherman Juice CS4 is their second largest Juice model, and just like its bigger brother, it&apos;s the perfect size for a purse, pocket, glove- or tackle-box. Smaller hands will appreciate all the same power and features as other full-size multi-tools, with handles sculpted just for them. The colorful Juice CS4, now available with textured aluminum handles might just make the &apos;junk&apos; drawer into the &apos;I-don&apos;t-need-anything-but-my-Leatherman-in-here&apos; drawer.